DiscGolfer is the official publication of the Professional Disc Golf Association and is published quarterly. It is one of the many membership benefits provided to PDGA members and is distributed four times per year. Back issues of DiscGolfer are available online for fans of disc golf everywhere! These digital editions make it easy to enjoy all the premium content and great features of the print version without the paper cuts. 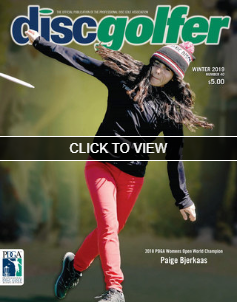 Click on the image below to view the Winter 2019 edition of DiscGolfer. Once the issue opens, click or touch anywhere on the screen to pull up the navigation menus and other options. If you are using a computer, use your mouse to click on the arrows on the left and right edges of your screen or use the left and right arrows on your keyboard to turn the pages. If you are using a mobile device, just swipe left or right. For more information, call (864) 674-7823 or email DiscGolfer Advertising. Greetings from the staff of DiscGolfer, the PDGA published magazine that was launched in 2009. As befitting a magazine that is financed by the player-driven PDGA, we’re asking PDGA members (as well as all interested disc golfers) for your best stories, photos, and ideas and suggestions. After each issue, we will want feedback—be it a compliment or a critique. We want DiscGolfer to reflect the experiences of the entire range of people who play this great game—be they champions or passionate duffers. We all have stories, and we want to print the best ones that can be shared in a general-interest magazine. Where disc golf may end up in five or 10 or 20 years is open to debate, so for now we want to document this wonderful journey as we ponder disc golf’s eventual destination. Writers, which might very well include the increasing number of bloggers out there, please let us know if you have a story you’ve already written or you’d like to write. Or perhaps you would like help to provide tournament coverage or work with us when we cover the larger events. Please introduce yourself and send your submissions or synopses of possible stories to [email protected]. Photographers. The digital revolution in photography means that more people than ever are shooting photos all the time. Almost all digital cameras (including many cell phones) have the capacity to produce photos with enough density for magazine printing. We need original unedited photos with the event name, person pictured and photographer credit on every photo submitted. (Ex. 2013 Pro Worlds Paul McBeth by Suzie Shutterbug). Of course, the challenge remains in getting great photos. Types of photos that we’re especially interested in are tournament shots, great holes, people having fun while golfing (this can be a tournament or just recreational play), and scenic shots. Of course, if you have an idea for a photo essay, like documenting a great course or highlighting a few of the best holes in your city or state, let us know. Please introduce yourself and/or send your ideas or samples of your photos to [email protected]. Reviewers. We hope to review new equipment, including bags, straps, other accessories, and possibly, new discs. In addition, we want to find at least two or three regular reviewers who will critique the growing number of disc golf videos. This is just a random idea, but if someone or several collaborators would like to develop a system for rating tournaments, we’re open to these kinds of ideas. Write us at [email protected]. Local reporters or stringers. While we will have tournament coverage in DiscGolfer, we want to report what’s happening at the grassroots level as well. This might include, but definitely is not limited to, new courses getting funded, quickly developing amateur players, local celebrities or businesses getting involved in disc golf, and different kinds of disc golf events like state or corporate games or significant charity events. If you’re not a writer, you can still provide us with leads about your local happenings, and we can take it from there. Write us at [email protected]. Web watch. There’s a large and growing body of information about disc golf on the World Wide Web. We’d like to point our readers to what’s best on the Web and what’s new. If you are among the disc golf Web cognoscenti and would like to share your knowledge with thousand of our readers, write us at [email protected]. Instructional. There will be instructional articles in every issue of DiscGolfer. As in golf, an interesting thing about teaching disc golf is that a person doesn’t have to be a successful tournament player to be an effective teacher. In fact, there’s an old saying that is of questionable origin that says, “Those who can, do; those who can’t, teach.” If you have something to offer in the instructional area or would like to help investigate the feasibility of creating something like the DiscGolfer Instructional Advisory Committee, write us at [email protected]. Transitions. This is where we announce marriages, births, deaths, and other milestones. For births, include the name of the child, date of birth, and city of birth. For marriages, include the groom’s name and bride’s maiden name, the date of the wedding, the city of the wedding, and where the couple resides, if different from the wedding city. This is the same feature that used to appear in Disc Golf World, so we hope to hear from all of you who have had transitions during 2011. Send to [email protected]. Other areas of editorial interest for DiscGolfer include course management issues including environmental concerns; fitness benefits of disc golf; parks and recreation departments’ perspectives of disc golf; cartoons and humorous stories; and local disc golf club organizational, legal, and financial issues. If you share an interest in any of these topics or other disc golf related topics, please write us at [email protected]. Please note that the stories email will be going to Editor Randy Michael Signor and Senior Editor Joe Feidt, photos to Photo Editor John Whinery, and instruction to Instructional Editor Scott Papa. Please direct your inquiries to us directly as we'll not be answering questions on the message board. We're all really stoked about producing this magazine, and look forward to hearing from many of you.